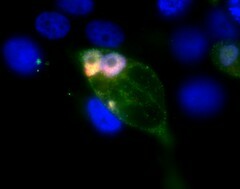 Active TGF-beta (green) and latency-associated factor (red) in human breast cancer cells (nuclei, blue). TGF-beta is a pleiotropic signaling molecule found in the extracellular environment of cells that helps suppress tumors and promotes cancer metastasis. TGF-beta is typically found in an inactive form where the active TGF-beta is bound to latency-associated peptide (LAP). Only after dissociation of LAP from TGF-beta can cells sense active TGF-beta. This image measures signaling by TGF-beta in a human breast cancer cell line.